July 19. A small setback, but a great party! Dropped down to 7th for Division 6, but there's still plenty of time for Brown Sugar to move to the lead. The celebration lasted a few hours-decorations champagne, snacks, some stories , steaks, ice cream, presents, costumes, stories , modeling with clay(Linus has a talent! ), a movie, a few more stories.....This may have impacted our performance. We dropped a position (Ca girl) by a few miles. Noses back to the grind stone today. We should post our best day yet. Thanks goes to Linus and Scooter(Lisa too!) for their preparation for the halfway celebration. Encouraging...you can actually read the word "Honolulu" now on the tracking chart! July 18. Up another notch! Approaching Halfway today. 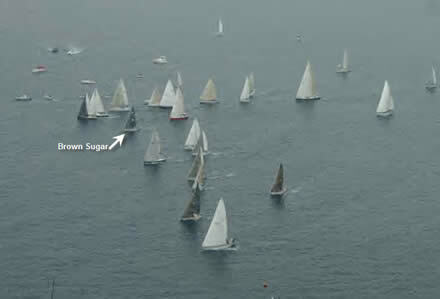 Methodically picking off one boat each day will get Brown Sugar to Hawaii in 1st Place! Sounds simple. With some luck, they could arrive on Wed, 7/25 after just 16 days at sea. BS (6th) has picked off another competitor -Ca Girl.We are now in our grove where we can work on slowly nibbling away at the remaining boats in our class. We are riding the tail pressure from tropical storm Cosme. This has created 6 foot swell pushing us to the finish. Team Techies (Turk & Horst) now hold the record for miles clicked off to the Barn-28 miles in three hours. Winds held in the 15-20 knot range allowing some surfing. The tropical depression brings both breeze and precipitation. We welcome these little cells of 18-20 knots to get the boat moving. Today we will celebrate the halfway point. Which will actually occur at 1140 miles to go at this writing we about 90 miles away. I assume Bryan Samuel Allott will document the festivities as only he can. Champagne is chilling and the Filet Mignon thawing. July 17. Moving up in the Standings. Tower sailed down to our line this morning and is sailing in front of us and walking away. Yesterday evening, Rancho Deluxe passed us making more southing than us. We saw their lights a better part of the night. This is a good omen. They are 1st and 2nd in their class. We picked one boat off today- trying to make that a daily practice. The Transponder Tracking system never has come back up for the boats that started Monday (Div 6, Aloha A, Aloha B). The only position data for the last few days is radioed in at 0600 each day. No word on whether it's going to be fixed. XS Racing's report on the tropical storm: As for the threat of Tropical Storm Cosme from waters off Mexico, the National Weather Service said Tuesday that "the initial intensity has been conservatively lowered to 40 knots and the official track forecast brings Cosme near or over the Hawaiian islands in 4-5 days. The official intensity forecast maintains Cosme as a weak tropical storm through four days.". July 16. Where'd they go? They're totally off the map. Further checking shows that there's trouble with the transponder tracking service. Finally this PM we have word from the boat. Working south for more wind. Light air is hurting everyone to the north. This move hurt us in the daily position report now in 8th. We are seeing more pressure- a good thing. A tropical depression is working its way up toward the course and moving along to Hawaii. This will bring more pressure on the south latitudes. At the speed it is currently moving, some boats may be able to ride the pressure bubble all the way there. I suspect we will just be chasing behind. 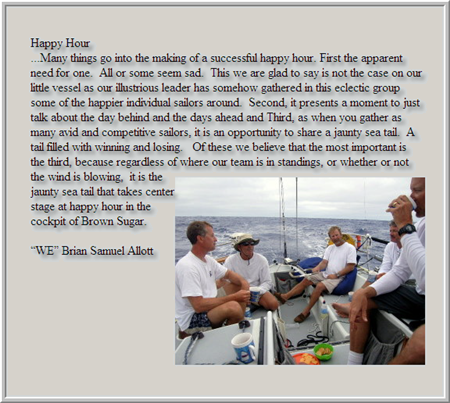 The final start of the 2007 Transpac race started out in zero to 4 knots of wind at 1 pm and finally filled in to 10 knots around 4 pm. The two standouts for the race to the west end of Catalina were Pyewacket and Rosebud as they managed to inch their way to the head of the fleet. 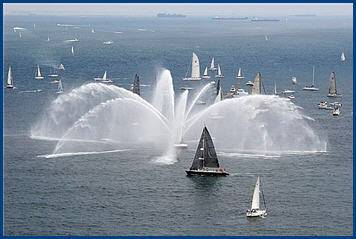 Thanks to www.XSRacing.org for this photo of the 3rd and Final Start. Only 1701 Miles to go! No Tracking info for Div 6 today. The software seems to be confused, BUT there is data for the 50/52 fleet who is now just ahead of Div 6. They're still moving along nicely, so we'll have to assume that Brown Sugar is doing the same. BS positions remains 7th. 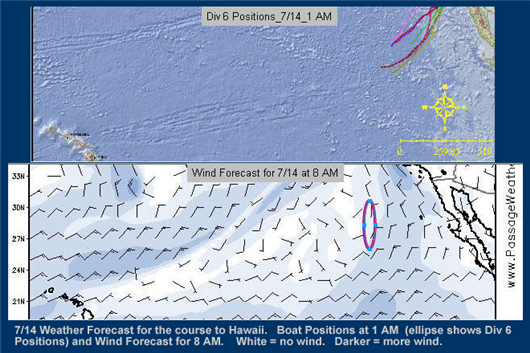 Everyone is jockeying for position in the slot and guessing which way the wind will blow to Hawaii. Still satisfied that we can still earn a better position than where we currently stand with 1701 miles to go as of 06:00 this morning. We believe we saw California Girl off in the distance crossing our path about 02:00. Tracking the class closely. The weather is mostly cloudy, making us more comfortable. In full sun we bake. All is well aboard- we have developed a good watch system 3 hrs on 6 off and typically get 2 two hour naps. ..
July 14. Pray for Rough Water. We paid our penance yesterday and are in wind today. This cost us in daily position from 3rd to 7th. We are back in the hunt and will be optimizing on closing the gap. Brilliant (1st)and Peregrine(2nd) had an excellent run and will be difficult to catch (not impossible). With 11 knots of breeze we can get in our stride. 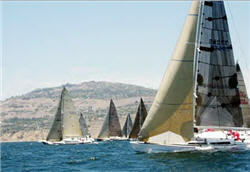 With a 75 mile deficit and 9 days to go that is only 8 miles a day or 0.3 knots faster. Team Brown Sugar fighting hard!!! The evening report. A solemn day aboard BS. The only sighting today were two wayward fishing floats and two sea birds;. both within a hour of one another. Other than that it was mostly sunny day. Blazing most of the time. We are still trolling for fish. Not very likely now that we are 500 mile off-shore. Typically we would see a couple of ships- we must be out of the regular shipping channel. With any luck- we should be improving in or standings.Barometers finally dropping and clouds forming- all good signs we will have some more wind. The favorite equipment on the boat is the bean bag chairs and water maker and refrigeration. Not sure how well equipped the lead boats are! Perhaps they are more driven!! Not that we are not driven --just a bit more comfortable. The Chef has outdone himself-Eggs and sausage for breakfast- Spam taco (was supposed to be fresh fish taco) and Chicken terriyaki salad for dinner. Not too shabby for roughing it! Did you hear the one about the camel? Check out our Blog for some funny stories today. July 13. A Rough Day. Today started out pretty good, the wind had picked up and the boats were moving well. 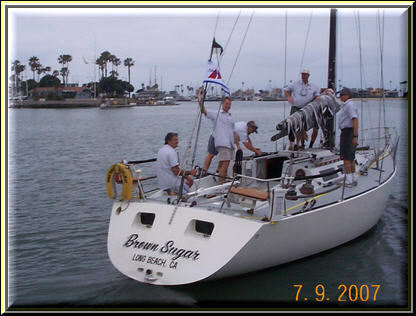 With 1938 miles to go, Brown Sugar was holding at #3 in her Class. Shoulda- woulda- coulda Gone south! Maybe! Still digging south and suffering. Oh what a difference 3 days make on starting this race and 5 days may be even better..
Persevering this light stuff and working on our tans. It is a good thing Horst has 14 days worth of tunes we enjoyed some really good obscure tunes.. Hoping the pint of blood we donated today will be worth it. July 12. A Fresh Start??? Start # 2 (for Divs. IV, V and 50/52s) was at 1PM today and the conditions were perfect. Hopefully they'll bring some of that breeze out to Brown Sugar. 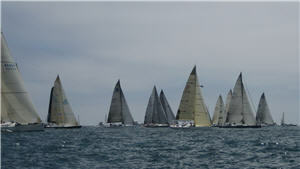 Thanks to XS Racing for another great photo of 7/12's Start. 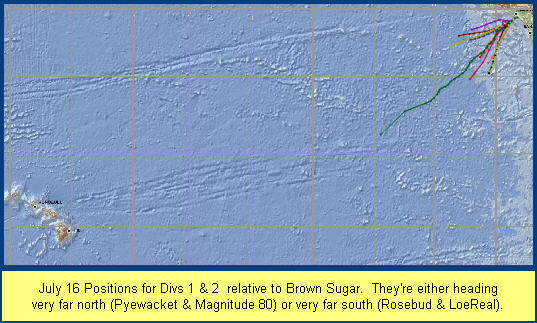 This morning's report lists Brown Sugar as #3 for Div VI--encouraging news. Sky is clear, and the night sky is filled with stars. No moon yet. But it will be a spectacular rise in the wee hours. Positions at 4PM Wed, 7/11. 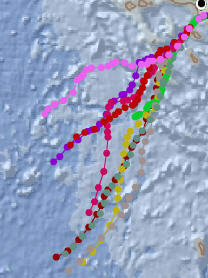 The southernmost boats have had the most consistent speed, but they sure are covering a lot of territory. Tommorrow's report should be very interesting. The weather looks like more of the same for the Div IV, V and the 50/52 Fleet Start at 1PM Tomorow. 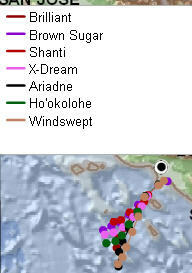 X-Dream stayed north, while Brown Sugar and Inspired Environments are keeping each other company mid-fleet.